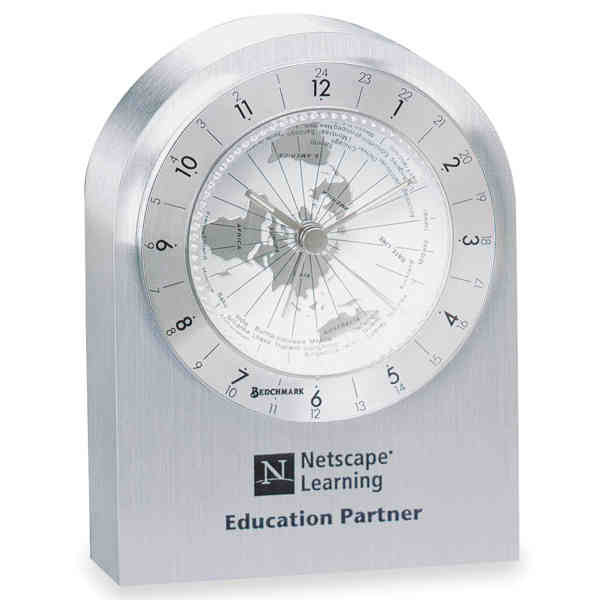 Imprint Method: 4 Color Process - Keep the world within reach with this beautiful; brushed silver arch clock! Featuring a classic; sleek design; this clock has the ability to tell you the time in several international cities. Never make an accidental 3 AM call to overseas again! Measuring 4 3/4 x 3 1/2 x 1 1/4 this timepiece also has various optional imprint areas. Imprint on plate with 7/8 x 2 1/2 of space. Keep with the times! Battery included. Size: 4.75 " x 3.5 " x 1.25 "